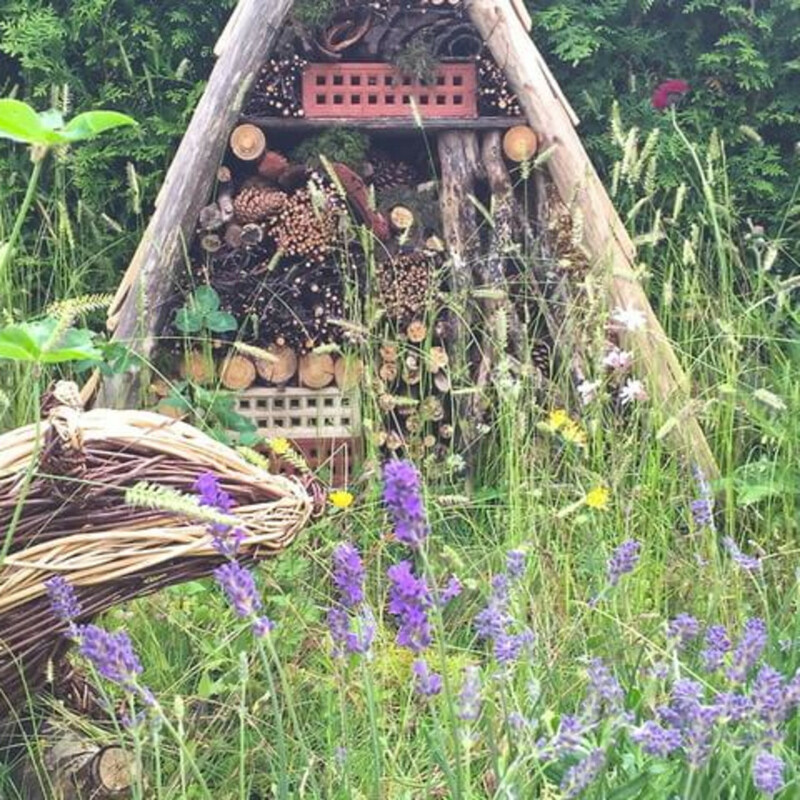 Rustic gardens are great havens for wildlife and work well even in the smallest urban spaces. 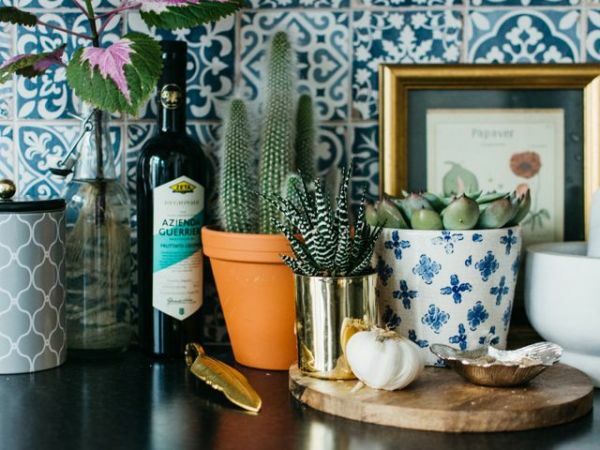 If you hanker after a more rustic, lived-in feel for your garden, start by visiting local vintage markets and snap up some wonderful bygone treasures, from old tools to stone troughs, window shutters, metal gates, zinc buckets, and worn cobblestones. If you’re feeling creative, look for discarded pallets or driftwood to turn into handmade furniture or garden ornaments. Build in country-style fencing. A rustic hardwood fence will not only look great but can last for years. The wooden stakes in a fence like this can be attached by taut, twisted wire or nailed to horizontal bars. Using tree trimmings from a sustainable, well-managed forest where pesticides aren’t used will help ensure the health of our woodlands, which are a haven for wildlife. Get creative with containers. 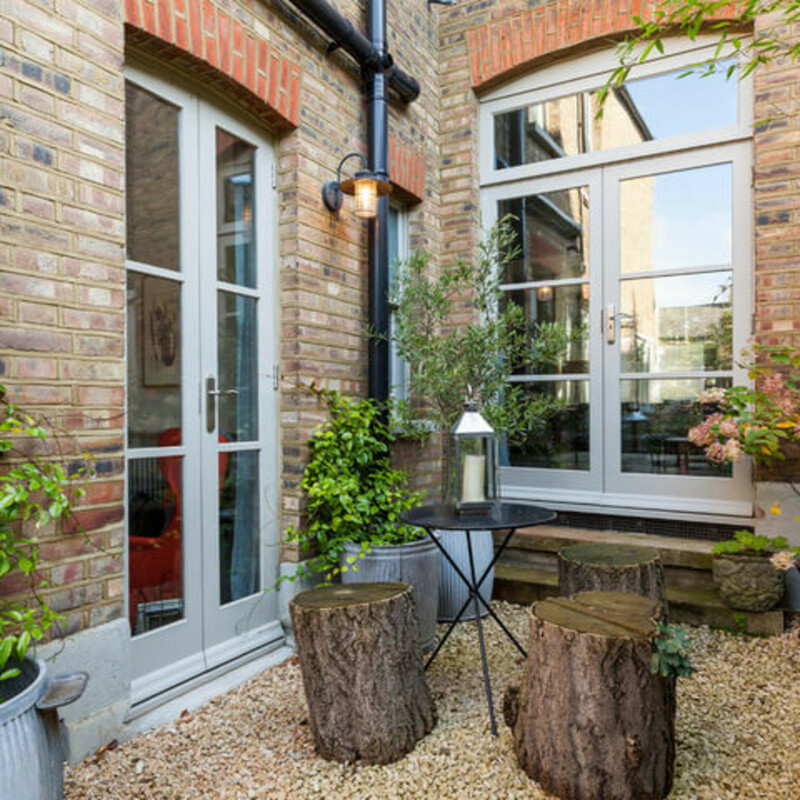 Using different styles of containers will help you achieve a more rustic look for your urban garden, balcony, or roof terrace. You can use so many things as containers for plants: tin cans, zinc buckets, stone sinks, animal troughs, vintage wooden crates. Just make sure you provide drainage holes at the bottom and choose the correct compost. Containers can be gathered and made into a small tabletop collection, much as you might arrange a group of photo frames and other ornaments inside the home. Welcome wildlife. 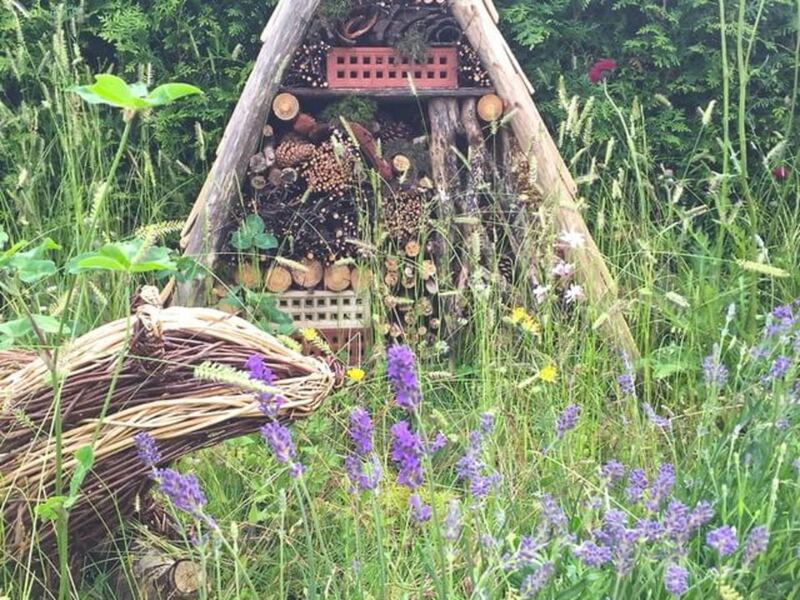 In addition to installing bird boxes, a birdbath, and bird feeders in your garden, consider adding an insect hotel to encourage beneficial creatures. 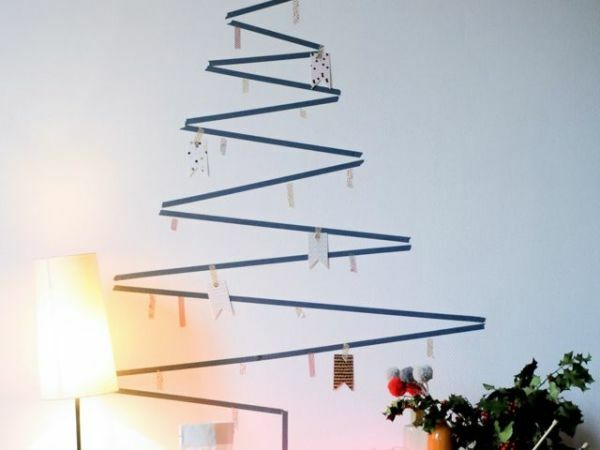 You can buy ready-made ones or easily construct one from an old pallet or any other recycled wood. Fill the gaps with dead wood for stag beetles, wood lice, and centipedes. Cut bamboo canes into bundles for solitary bees. Fill other areas with dry sticks, straw, and dried leaves for many garden invertebrates and tiles that newts and frogs can hide beneath. Branch out. 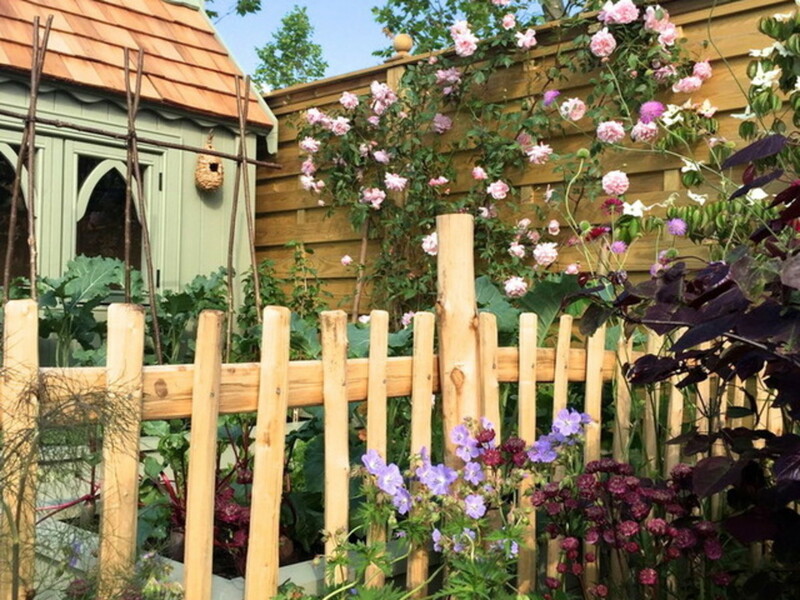 To create height and add interest, use handmade hazel or willow obelisks. 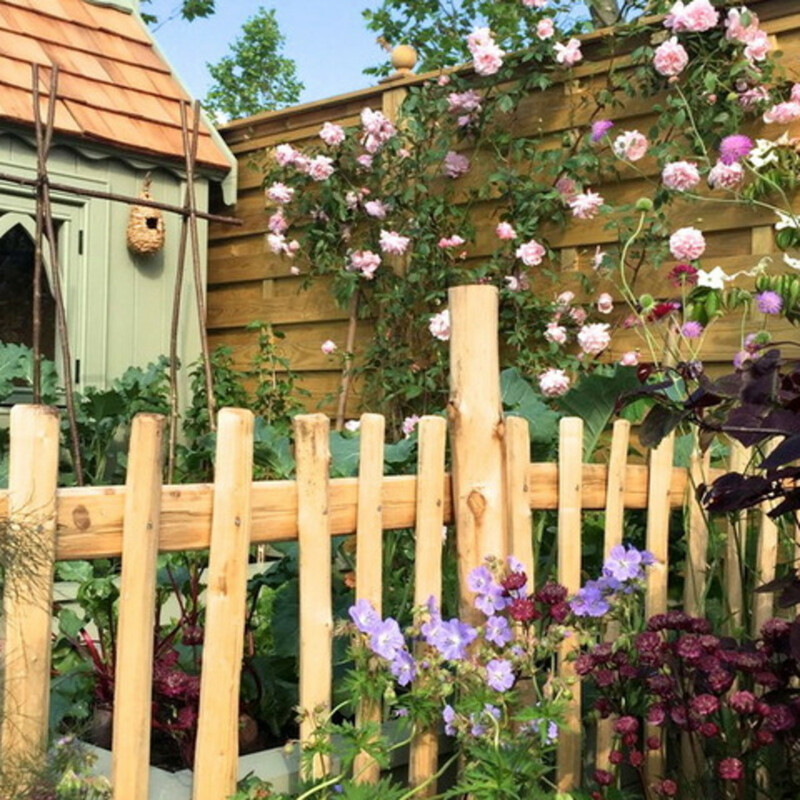 Willow and birch branches can also be woven into other rustic features if you have the space in the garden for items such as pergolas and arbors. Obelisks can be used to support climbers in large pots even if you don’t have a garden. Choose a pot that’s the right size for the obelisk and push the canes into the soil, so the structure won’t get blown off by the wind. Plant clematis, sweet pea, roses, and other climbers that do well in pots, although you’ll need very big, deep pots to establish a good root system. Pick up a pallet. Pallets are such versatile items: Use them in the garden to create anything from benches to vertical gardens, vegetable gardens, tables, tool storage, and much more. If you want to use a pallet as a vegetable planter, make sure it hasn’t been treated with or exposed to harmful chemicals — and be warned that most of them have. To support plants, you’ll need to get crafty with landscape fabric and a staple gun. Look online to browse various techniques for using these to create the necessary plant pockets to turn your pallet into a planter. Pave your way. For a really rustic touch, mix paving with old bricks, worn cobblestones, and irregular flagstones; hunt for a good mix at local salvage yards. Gravel also works well for a rustic mood and looks good mixed with bricks and among clusters of scented plants, such as thyme. Let your plants wander. Self-seeding plants drive some people to distraction, but for a rustic feel, they are to be encouraged — as long as you don’t mind where they appear! Varieties of self-seeding plants include granny’s bonnet, toadflax, forget-me-not, foxglove, and poppy. Also consider introducing mind-your-own-business between the gaps in paving, and soon it will naturalize, creating a soft, verdant mat. Weave in natural seating. 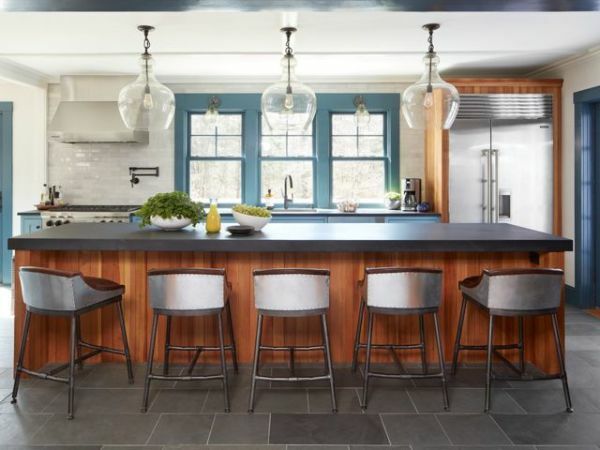 There are various ways to create rustic seating. You can pick up old metal or wooden garden tables and chairs with a wonderful patina at flea markets and vintage shops. Or you could find local craftsperson-made wooden benches, tables, and chairs. Don’t be afraid to mix and match different types of chairs. 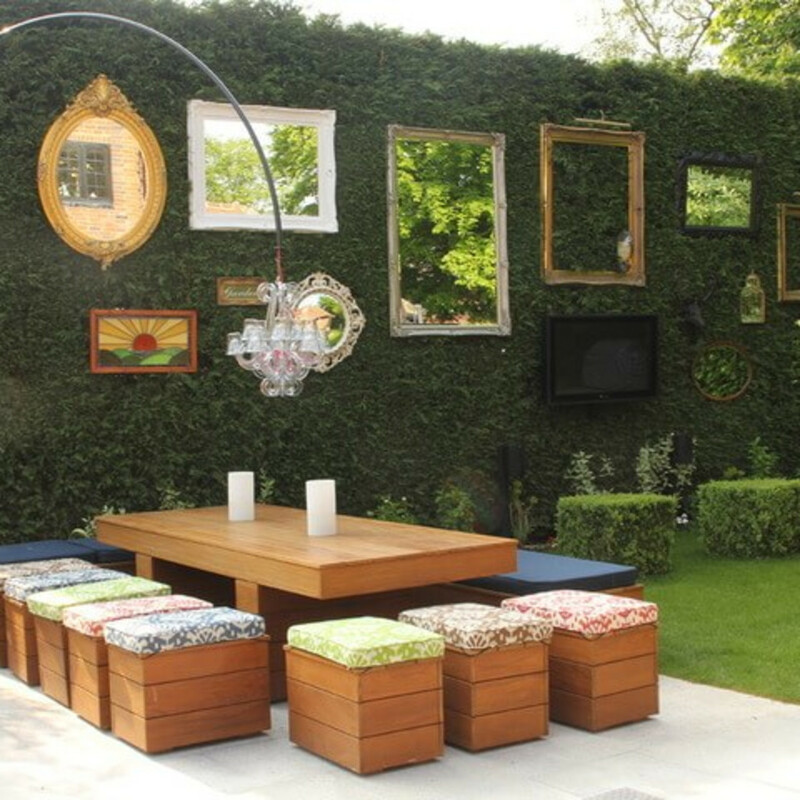 To enhance the seating area, add galvanized steel containers planted with trees or perennials. Step up your displays. Repurpose an old ladder as a plant stand to add vertical interest. Painted or left untreated, ladders are great for displaying many different plants and work just as well indoors as outside. Plants will get more sunlight and air circulation than in containers on the floor, which will help with flowering and avoid diseases. Scour vintage fairs and flea markets to find old metal gates, shutters, window,s and all sorts of similar pieces to add to the rustic feel. You can easily pick up galvanized steel buckets and watering cans too, which work well on ladders as decorative items or can be used as planters with drainage holes drilled in the bottom. Go modern-rustic. 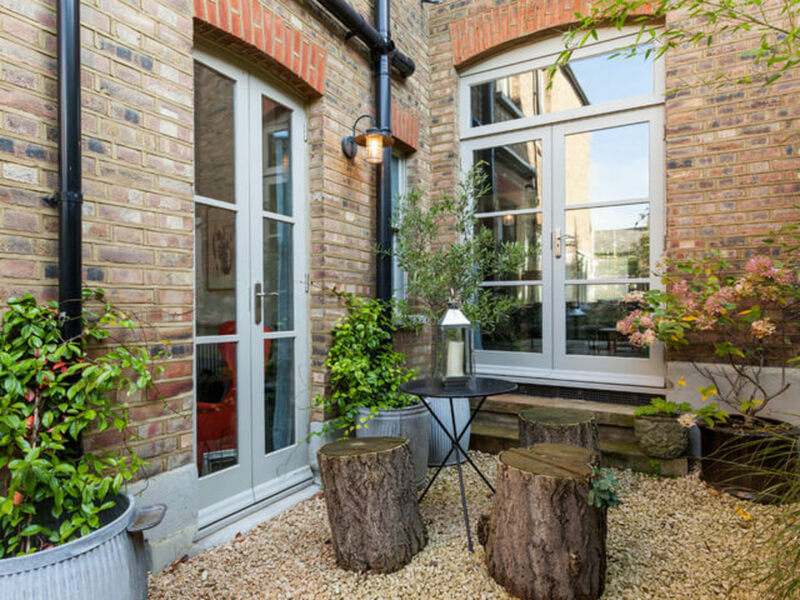 For a real rustic garden, you’d normally use discarded old mirrors, sash windows, painted wooden shutters, old doors, and metal gates to create focal points. For a more contemporary take on the rustic look, however, use smooth paving and furniture with clean lines. 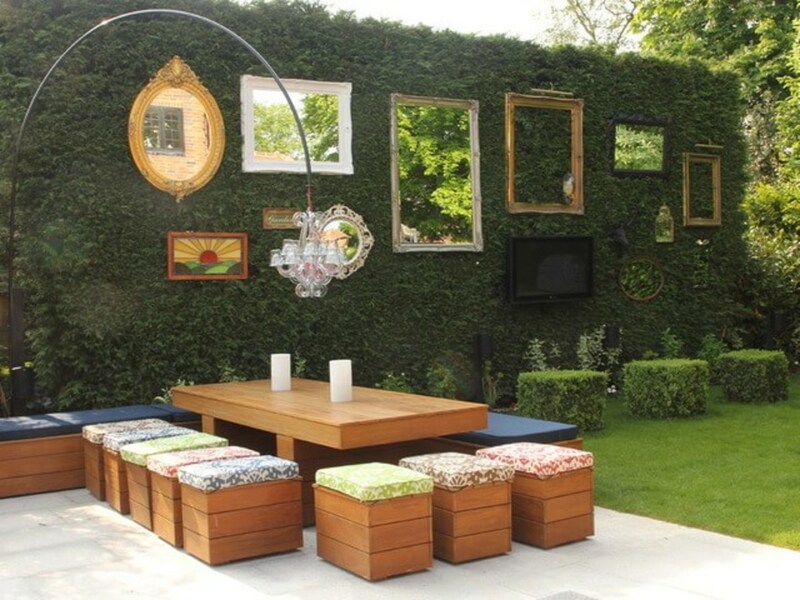 Add other touches by decorating a green hedge or fence as you would a wall in the house: Hang outdoor pictures and mirrors and stained-glass panels, creating the feeling of an outdoor living room.